Chimneys are a great addition to any home, but they require equally as much maintenance as any other aspect of your home’s exterior. Especially when you have a fake chimney, you have to keep it well maintained to avoid leaks and irreparable damage. Listed here are four signs that you may want to get leaking chimney repair. Cracked or missing mortar When your walls are built of brick or stone, mortar is that filler that sits between them and helps to hold and bond it all together. When the mortar starts to chip, to crack, or only comes out of the wall, you might have a problem that can be fixed with Leaking Chimney Repair. When the chimney leaks, the bricks, and stone absorb the water that makes them more porous; as they become more porous, the mortar stops sticking and holding the parts together. Damage to chimney crown The chimney crown is a cement layer that sits at the top of the chimney to keep water from getting inside or pooling around the chimney. 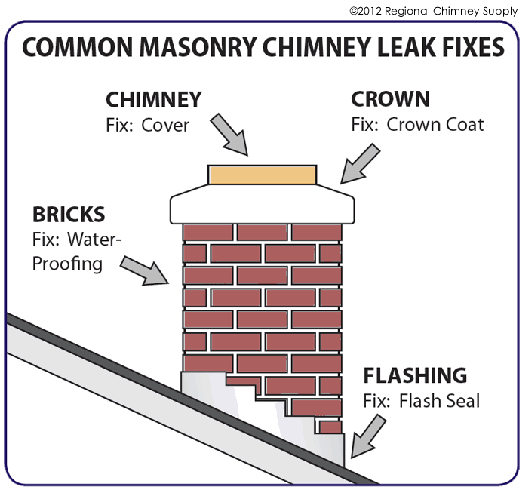 When there is any damage to the crown, such as cracks or missing parts, water is more likely to enter into the chimney or to soak into the surrounding materials. With chimney inspection and repair, the crown can be checked, fixed, or replaced as necessary. Rusty chase cover. The chase cover is an essential component of any chimney to keep objects, such as leaves, bugs, and birds, from falling into the chimney. It is also a diverter of water. A chimney leak repair service will always check the chase cover when they inspect your chimney. When the chase cover is missing or rusty or damaged in any way, it is better to have it replaced so as to avoid leaks and other complications. Chimney leaks are a common problem that can often be avoided with proper maintenance and upkeep. By making sure to take care of issues before an actual hole starts you will protect your home from potential costly damage. There are several ways that a chimney can become susceptible to chimney leaks. Every spring you should check the flashing around your chimney. After you make your repairs or have someone do the repairs for you, use a hose or bucket to wet the chimney. The piece that is placed at the top of your chimney around the flue is referred to as the head. Look down the inside of your chimney flue using a bright light. You are looking for obstructions and soot or creosote buildup. These caps are designed to protect the opening in your flue. Properly installed they can help prevent water, debris or animals from causing chimney leaks. If you have ever had water coming into your home from the ceiling, it is natural to think it is coming from the roof. However, there are a bunch of places that it could be coming from and the first thing you need to understand is how water travels in your home. It’s easy to think the problem causing a leak in your ceiling is something that is right above the dripping; or sometimes the gushing. It’s because water has a tendency to run along beams until it is thick enough to drip. That dripping, over time, is what causes the damage to the ceiling, which is generally made of drywall. Only hiring someone who specializes in these types of repairs and who has the equipment and know-how as to what to look for can you hope to find the real cause of the leak. Over time water erodes the mortar that is used to hold the bricks or stones together. It doesn’t take a huge opening for water to enter into the chimney and run down rafters into other areas of your home and cause a problem.